Cana Wine & Cocktails is the talk of the town when it comes to one of the best wine and cocktail lounges in the city. Customers love the Rombauer Chardonnay and the swanky, intimate décor, bringing the big-city lounge vibe to Wichita. Patrons will love the friendly, knowledgeable staff who is willing to make recommendations if you’re not sure what to order! Located in the basement of the Ambassador Hotel, this is one of Wichita’s favorite cocktail lounges. 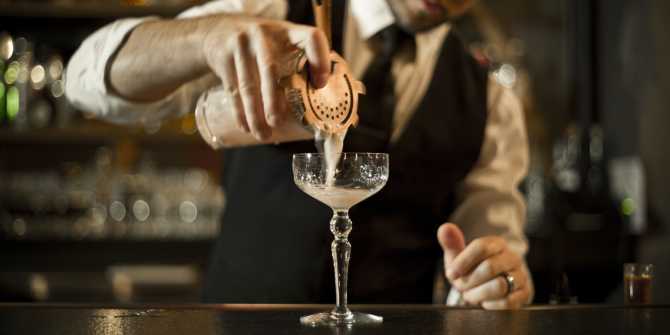 The dark atmosphere of Dockum will take you back to a time when speakeasies were a way of life for those breaking the rules during prohibition. Try the daiquiris or one of the amazing handcrafted cocktails on the menu. Whatever you choose, you won’t be disappointed. There’s a flavor for every palate at Mort’s Martini & Cigar Bar, where patrons can choose from more than 160 martinis or try a cigar from a quality cigar collection. Mort’s also has plenty of craft beers to choose from, as well as live music at least six nights a week. If you’re looking for an upscale cocktail lounge experience, head downtown to Vorshay’s Cocktail Lounge. With candlelit tables, velvet chairs and a newly-renovated space with antique touches left over from the building’s days as a theater, you’ll feel like you’re sitting in the middle of New York City. Be sure to try their popular specialty cocktails like the Old Fashioned, The Godfather, the Rum Swizzle or The Jazz. Prosecco fans take note: it’s on tap here! Wine Dive is a local-favorite when it comes to cocktail lounges in Wichita. Patrons rave about the Sweet Caroline, made from Bacardi Limón, strawberry-infused vodka, lime, pineapple and orange juice. Wine Dive also offers a delicious menu and happy hour specials Monday-Friday from 4-6 p.m. If you’re looking more for craft beer options, check out one of Wichita’s 10 breweries or other great spots for nightlife in the city.